Increasing awareness of potential side effects from gadolinium-based contrast agents has underlined the need for contrast-free magnetic resonance imaging (MRI). Numerous recent articles evaluated the risk of potential brain deposits, with the result that research is putting the focus more on alternative unenhanced imaging techniques. The aim of this study was to determine the need for contrast media for chest MRI in primary staging and follow-up care of lymphoma. This monocentric, retrospective study encompassed patients under 25 years of age who had undergone histopathological examination of thoracic lymph nodes and at least one chest MRI examination with unenhanced and contrast-enhanced sequences. Seven different thoracic lymph node stations including mediastinal, hilar, periclavicular, and axillary regions were evaluated by two readers regarding lesion diameter, number, shape, necrosis, and infiltration of surrounding structures. Findings were categorized into suspicious (> 1 cm; round; necrosis; infiltration) or non-suspicious. Fifty-one patients (mean age, 16.0 ± 3.7 yrs) with thoracic Hodgkin (70.6%) and non-Hodgkin lymphoma (25.5%) and lymphadenopathy (3.9%) were retrospectively included. Most lymph nodes categorized as suspicious were located in the mediastinal station (86.4%). High agreement (κ = 0.81) between unenhanced and contrast-enhanced sequences was found for both suspicious and non-suspicious lymph nodes. Significant (p < 0.001), but small difference (1 mm) was observed only in sizing mediastinal lymph nodes (all other p > 0.05). No significant difference (smallest p = 0.08) was shown for the use of five different types of contrast media. MRI in young patients with thoracic lymphoma can safely be done without the use of contrast agent. 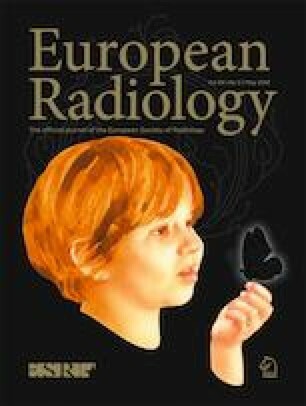 • Thoracic magnetic resonance imaging in young lymphoma patients can safely be done without gadolinium-based contrast agents. The scientific guarantor of this publication is Prof. Dr. Thomas J. Vogl, Head of the Department of Interventional and Diagnostic Radiology, University Hospital Frankfurt. Prof. Dr. Eva Herrmann, Head of the Institute of Biostatistics and Mathematic Modeling, University Hospital Frankfurt, kindly provided statistical advice for this manuscript.